My friend Rick is an angel. 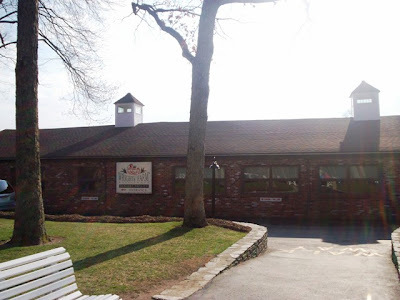 Without Rick, I would have never found out about the Xanadu that is Wright's Farm Restaurant. This all-you-can-eat chicken, pasta, fries, salad, and rolls wonderland seems to be very popular with large groups, the disabled, and of course, the rotund. Falling into that last category, Mom and I put on our eating pants and headed for Harrisville, RI. Arriving at about 4 p.m. after some wrong turns (turn LEFT off the highway to Route 146A/102 and keeeeeeep driving), we pulled into the very large parking lot. We were met by a parking attendant who asked us if we were with a large party. When we told him no, he told us that we could park anywhere near the main entrance. Since Mom and I had been here once before, we already knew where to go and quickly found a spot. There were already people roaming the lot and heading for the entrance, so I knew we were going to be in for a crowded dining experience. Once we stepped through the main entrance, we took a right and headed over toward the restaurant area. Because this restaurant/banquet hall is extremely large, I had forgotten where to go. Luckily, there was a couple in front of us that was also headed toward the restaurant, so I just followed them. Once we arrived at the hostess station, I told one of the girls that I wanted a table for two. She then proceeded to give me a list of directions on how I could find "Brittany," who was to be our guide once we arrived to our pre-selected dining area. After following a bunch of twist and turns, going down a ramp, and passing by two large bars, we finally spotted Brittany, who directed us to a nearby table. Thank goodness! Walking to our table was almost like exercise, and God knows that we weren't ready for that. We hadn't been waiting long before we were joined by our waitress. Her name was Kerri, and she was dressed in a Wright's uniform as was the entire staff. She asked us if we were going to have the chicken, and we both shouted, "Yes!" She also asked us what we would like to drink. Mom and I asked for Diet Coke, and Kerri offered to bring the drinks in either single glasses or a pitcher. 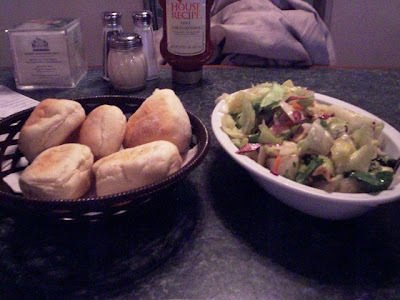 We chose a pitcher, and it quickly arrived along with our starters - a freshly made salad topped with a delicious Italian dressing, and a basket of rolls with butter. 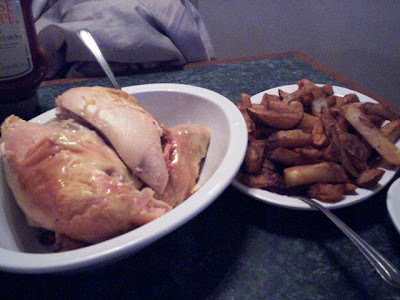 It wasn't long before our salad and rolls were joined by bowls of pasta with homemade sauce, fries, and Wright's tender, juicy chicken. The food was amazing. The rolls were served warm, and were very soft and fresh (we later found out where the rolls came from - Wright's Bakery). The salad was crisp, and the classic Italian dressing was cool and tangy. We both heard that everyone goes crazy over the fries. They're skin-on, and for whatever reason, tasted a little bit sweet. They were very potatoey, and quite good, especially covered in their delicious homemade ketchup. 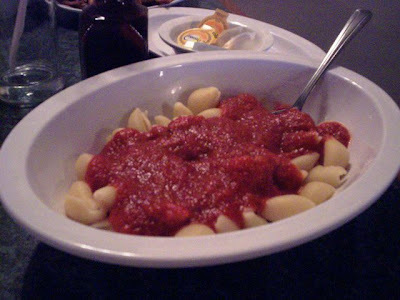 The pasta was of the shell variety, cooked nicely al dente, and was covered with a thick, homemade tomato sauce. It was spicy and tasty. Last but not least - the chicken. This was probably some of the best chicken we've ever tasted. Mom wishes she knew how it was prepared. We received two pieces of white meat, and two of dark. I wish I had known that you could request a particular type of meat, because I definitely would have gone all white (I'm not too big a fan of dark, although this dark was very tasty). The chicken was so moist that it literally fell off the bone when we picked it up. It was juicy and cooked perfectly. Mom said that she could make a meal of just the chicken. Although we only had one round of everything, we could have easily had seconds as the restaurant is "all-you-can-eat." Kerri had come over during our meal to ask how everything was, and with full mouths we had nothing but good things to say. Mom told me that there is also a sirloin option here (instead of the chicken). If the steak is as good as the chicken, steak lovers will have nothing to worry about. The interior, although a bit confusing, is quite beautiful. With ramps and large doorways, everything is easily accessible for people with disabilities. There are both booths and tables, depending on which room you sit in, and several bars scattered throughout. The rooms have a bit of an old fashioned look, but everything is kept neat and clean. 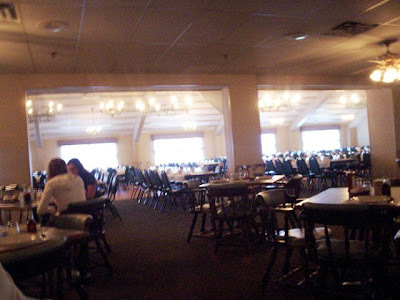 Wright's has several large rooms reserved just for parties, and according to their Web site, have a staff of almost 200 people to keep things running smoothly. 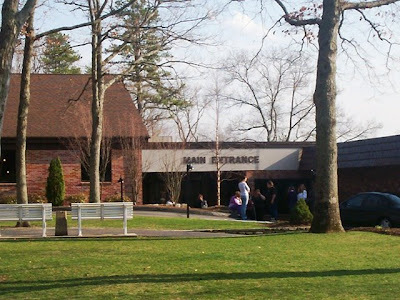 To the left of the main entrance is a gift shop where you can purchase their pasta sauce, Italian dressing, homemade fudge, and other candies and gifts. The picture below was taken just as we entered our dining area (hold the camera straighter next time, Ma), but the room quickly filled with patrons only minutes later. We left $33 on the table for Kerri which included a 20% tip. She provided excellent service. Before leaving, I filled out the comment card that was left on the table. I think that made us eligible for a free dinner, which would be fantastic! Mom and I decided to use the restroom before we left Wright's, and for handling such a large crowd, the bathroom was very clean and orderly. After leaving the restroom, we spotted an exit sign and decided to see where it led. We were hoping that we didn't have to take that long walk all the way back to the main entrance, especially after having stuffed our faces. Luckily for us, it actually led us right to the parking lot! I even spotted my car from the door, so all we had to do was walk through the little grassy area where a few people were relaxing on white wooden benches. Wright's is really a fantastic restaurant. Sometimes with family style places, the food can lack flavor. At Wright's, all the food is homemade and has an out-of-this-world taste. Plus, it caters to everyone from young kids to an elderly person in a wheelchair. I would definitely suggest having your next party at Wright's, or perhaps take the family for a drive on a lovely day and stop in for some chicken. You will not be disappointed. Wright's Farm Restaurant is open from 4-9 p.m. on Thursday and Friday, 12-9:30 p.m. on Saturday, and 12-8 p.m. on Sunday.